When Visiting Lake Ouachita, stay here at Christina's Little Cabin. A quiet rustic two-story 1800's cabin with modern conveniences. The cabin is nested 1/4 mile from the Twin Creek access to the majestic Lake Ouachita. 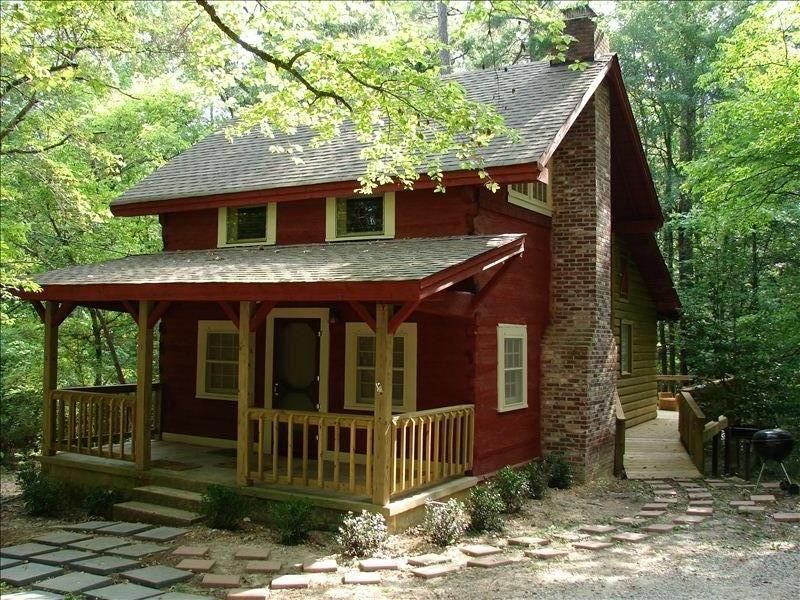 The cabin sits on 18 natural acres adjacent to the Ouachita National Forest. Home to Arkansas native trees and numerous wildlife. Take a walk or bike around and explore the native wildlife and vegetation located around Christina's Little Cabin. The original logs, a nice 1/2 wrap and the back and side deck complete with a picnic table, and grill welcomes visitors. The inside offers the original 20 foot beams, natural tongue and groove pine flooring. The cabin offers two bedrooms with queen beds, 1 1/2 bath, living room with a flat screen TV/cable, gas fireplace, and a modern kitchen with kitchenware. The living room is equipped with a luscious sofa, love seat, leather recliner, a rocking chair and waiting chairs. Entertain with a flat screen TV equipped with cable and a DVD player. On cool winter nights snuggle up to the gas-burning fireplace. Family games provided. The kitchen is fully equipped with all the modern kitchenware a family needs to whip up your favorite meals. Including a full size range, refrigerator, dishwasher, and microwave. The Kitchen shines with new granite counter tops and deep stainless steel sink. Bring your food and grill supplies. You'll be ready to get started. The outer bedroom queen bed is decorated in a black and gray nature theme comforter to accent the black round corner post bed. A dresser and cedar lined closet awaits the occupants of this room. The inner bedroom queen bed is decorated in a blue and tan nature theme comforter to accent a white pine bed frame and headboard. The cabins outside has the authentic original hand chopped logs. A nice half wrap around back and side deck complete with picnic table, and grill welcomes visitors. Perfect for sitting, visiting, playing, grilling, and eating. Inside offers the original dark black 20 foot beams in the ceiling. The walls sport a natural oak tongue and groove. Last, the flooring shines with the original pine flooring. New lighting and ceiling fans add to the interior. All is air conditioned and heated. The cabin is equipped to sleep 5 - 6 people. Nestled a quarter of a mile from the Twin Creek access to the majestic Lake Ouachita. With a 10 minute stroll or two minute drive, your family can encounter a sandy beach or banks of the Ouachita. If the timing is right you may enjoy the awesome display of color as the sunrises or sets. To top off the wonder of Lake Ouachita, you may have the opportunity to get a glimpse of the soaring national bird: The Bald Eagle. Local boat and water toy marinas can offer your family a day of sun, fun, and recreation. Fishing, boating, tubing, and water skiing are all options. Enjoy the clear waters of the largest and cleanest man-made lake covering about 49,000 acres. Lake Ouachita is one of the top Bass Fishing Lakes and there are fishing tournaments through out the year. Largemouth bass, striped bass, walleye, bream, catfish, crappie, blue gill and for the little fisherman: Sun perch off the banks can be caught. Lake Ouachita is a fishermen's paradise. Other lake activities include scuba diving, swimming, and sailing. If a quite resting place is more your style, the half wrap around deck is calling your name. Sit and enjoy Arkansas natural wildlife and greenery. Different species of Arkansas trees sway overhead. As critters jump from limb to limb. The birds add color and sound to the natural beauty. Twigs crack and forest floor leaves rustle as early morning and late afternoon deer amble through the back forest. Your family may also enjoy hiking and mountain biking through the 18 acres adjacent to the Ouachita National Forest. Come and enjoy Gods Beautiful Masterpiece. Riding Stables: 10 minutes away. Enjoy a scenic guided trail ride through the beautiful Quachita Mountains. Healthy well groomed horses and the cleanest stables you've ever seen await you. Don't forget your camera. Youngest to oldest, come as you are for a most memorable ride. 10 minutes away. Local dinning can take care of your hunger needs with their country cooking and fresh made pies. Watch those pies fly off the shelf. They will also take your cleaned catch of the day and turn it into a delicious meal. Local Marinas await all your fishing, boating, and playing needs. See the Marinas for barge, boat, or motor rentals, boat stall, ice, live bait, gas, oil, tackle, licenses, and accessories. Mount Ida is named the "Quartz Crystal Capital of the World" and there are many crystal mines for you and your family to dig for quartz crystals. Information about the various mines, hours of operation and costs, and information about the local rock shops can be found on the Mount Ida Chamber of Commerce web site. Great Arkansas hiking and mountain biking occur in the Ouachita Mountains. Womble Trail, Gaston Mountain trailhead, Big Brushy trailhead, Ouachita trail, Little Missouri Falls, and many more experiences are available at the local trails. Great Arkansas hunting and fishing occur in the Ouachita Mountains and Ouachita Lake and Rivers. See local rule and regulations can be found at Arkansas Game and Fish. Great Arkansas State Parks. The adventure of a lifetime awaits you at the only public diamond mine in the world, Crater of Diamonds State Park in Murfreesboro, Arkansas offers an experience of a lifetime: the opportunity to hunt for real diamonds and to keep what you find. Awaiting you at Crater of Diamonds is over 37-acres of plowed field . Hot Springs about 25 miles away. Bryan--A 30-year poultry and cattle farmer turned 10 year realtor. Donna--A 25 year educator. Patty Anne--Aspiring Vet and Equine Fanatic Family of three whom have lived in Montgomery County all our lives. We enjoy the Small-Town and Loving Community Atmosphere. History of Christina's Little Cabin----- When Lake Ouachita was built, this rustic 1800's cabin was moved from across the lake on mountain farmland at the base of Twin Creek. It rested in an old settlement called "Elenora". Later known as "Silver" where silver mining took place. Presently called Twin Creek. ----- Our family recently acquired this cabin as a realtor's first purchase. A 20-year poultry and cattle farmer turned realtor. This property was a God send that eventually included this cabin. This cabin is named after our daughter. Thus we have: Christina's Little Cabin. Nestled 1/4 a mile from the Twin Creek access to the majestic Lake Ouachita--- 5 minwalk or 2 min drive--- Scenic View--- Sandy beach or banks of the Ouachita--- Colors of sunrise or set. The kitchen is fully equipped with all the modern kitchenware a family needs to whip up your favorite meals. The kitchen is equipped with a full size range, refrigerator, dishwasher, and microwave. The Kitchen shines with new granite counter tops and deep stainless steel sink. We had thr bdy time celebrating my sons 10th bday. It was relaxing as wel as exciting. We hiked, fish, swam, had smores and found wildlife to play with. A must visit again, soon. This family was a great family to host and a joy to work with! Nice sized, rustic cabin nestled in the privacy of tall pine trees. Only about a mile or two away from the Lake Wauchita Shores Marina where we kept our boat overnight. We all had a blast! I highly recommend this place. This cabin was perfect for our vacation. The location is great for hiking, boating, four-wheeling. It's nestled in the woods on a very quiet road. We enjoyed eating breakfast on the large patio out back and listening to the sounds of nature. We had three adults in our group and the size of the cabin was just right. It was as clean as could be. The best part: there is no long list of "chores" you have to do before you leave. Just lock up and go. Owner is very attentive and the cabin was spotlessly clean. The pictures represent the cabin well. It is a daring little place, The huge deck and front porch was wonderful if the mosquitoes aren't bad. Adding a couple of lounge chairs would be nice. The kitchen was well equipped. The full bath is very small but well done. We found it a challenge because there is no place to set any personal cosmetics. The upstairs half bath has vanity space but no usable mirror for shaving or doing hair and make-up. A full supply of towels were provided. The bedrooms do not have dressers or mirrors so if you are travel with several people it would be a challenge for everyone to get cleaned up using only the one mirror in the main bath. The air conditioning is wall mounted and had no problem keeping the cabin cool and comfortable. The units do however have a pretty loud hum like the sound of a phone off the hook. We were out and about a lot so it wasn't much of an issue, but if you were planning to stay inside for several days you should be aware of this. The TV channel selection is very limited if that is important to you. We really liked to location as we wanted to do hiking. We suggest the Womble trail leaving from the trail head off RT 27 N across from the Fishing Village sign as a nice day hike. We would stay here again of coming back to the area.